Bass Boat Seats Ship Same Day. Order By 4pm EST. 52" wide bass boat bench seat with 17" wide center storage console and step. Featuring our high back, plush folding bass boat seats. Factory grade folding boat seats come with pre-installed hinges with matching vinyl hinge covers. 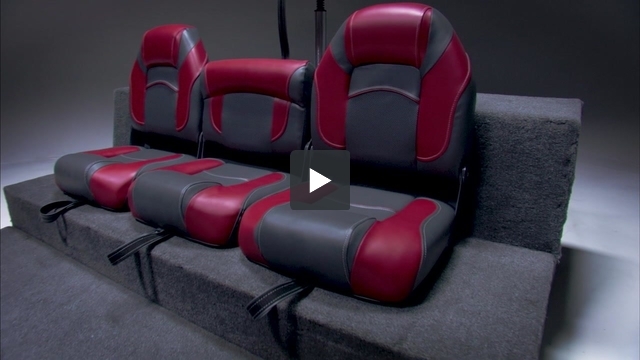 Heavy duty, powder coated hinges match the seats and will never bend or break. 17" wide center storage console is a true step. Center storage console features cup holders with storage bin and enclosed storage underneath the step. Made from Teflon coated, heavy duty rotationally molded plastic it comes with a lifetime warranty. Built to be a true step, the lid to the enclosed storage area will support any angler. Great seats, great price. They look and fit nice in my bass hawk. The customer service is something that's rarely seen anymore. They take care of there customers. With their customer service they have made me a customer for life. A FIRST CLASS COMPANY!!! THANK YOU!!! !